This e-version of Praana Praanee Praanayam is an invaluable guide for all Kundalini Yoga students and teachers, in fact for anyone, interested in using pranayams (breathing exercises and meditations) in order to achieve mental clarity and inner balance. The in-depth content comprises possibly the most comprehensive collection of classic and never-before published breath techniques ever assembled. 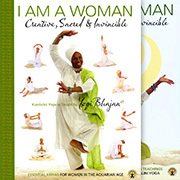 Well presented and complete with many beautiful illustrations and clear explanations taken from the original teachings of Yogi Bhajan, Master of Kundalini Yoga.